His novels have caught the attention of the famous and everyday readers alike; from Oprah, Cicely Tyson, Biil Gates, Warren Buffett, to Joe Smith, and Mary Brown. Now, Gene Cartwright's novels invade the world of e-books, distributed via Smashwords. Dec. 6, 2010 - PRLog -- Gene Cartwright has been called one of the most gifted, insightful, though not yet widely known literary voices to come along in decades. His works clearly defy stereotype and rigid genre classification. That fact only adds to his appeal. The question so often asked is: "How can one person have such broad empathy, insight, and range despite the age, gender, ethnicity or background of the characters he so deftly creates?" 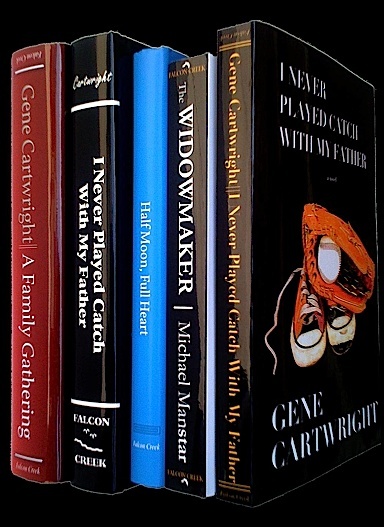 Gene Cartwright first novel, “I Never Played Catch With My Father,” created a huge stir in the publishing world when it debuted several years ago, and earned him an Oprah appearance. His third, “A Family Gathering,” was nominated for a Pulitzer Prize for Fiction in 2007. This family saga garnered Gene the praise of Emmy-Award, winning, Oscar nominated icon Cicely Tyson who called it the most moving and powerful novel she had read since Alex Haley’s “Roots.” Ms. Tyson has already "laid claim" to a role as her favorite character in the book. "The Widowmaker", Gene’s fourth novel, written as Michael Manstar for the John Roméo series, displays his unique versatility. This police/psycho-thriller takes the reader on a ride so realistic; it has reportedly caused some readers to alter their lifestyle, and behavior regarding monogamy. To understand why, watch the book-trailer on GeneCartwright.com or YouTube, and read the book for yourself. Available in Softcover and e-book. Now, these and other Cartwright hardcover/soft cover works are available as e-books. Gene also founded iFOGO.com, the innovative author/reader site that offers his, and thousands of other books, in full multimedia formats. See and turn pages of excerpts; hear many audio excerpts; watch book-trailer videos, and read complete author biographies. FREE EBOOKS: Buyers who purchase physical copies of Cartwright's novels at the author's site, receive a free e-book for each purchase. Presently, Gene’s e-books are distributed across the web, to scores of providers via Smashwords. They may be read on iPad, Kindle, Sony Reader, Nook, and virtually all e-readers. Gene also has penned several screenplays: "The Widowmaker," "A Family Gathering," "Fire Night," "A Quest For Angels," "Harold", and more. Agent: Gene is presently seeking the right literary agent. All rights to his works are available. About IFOGO.com. iFOGO.com is the new frontier for authors, publishers, and book-buyers. The company, created by an author, presents books in an interactive, multimedia format that informs and connects all three crucial parts of the book world. Includes a social network. iFOGO also enjoys tremendous growth in its social network component, iFOGO Village at ifogovillage.ning.com. There, hundreds of authors and readers actively connect.